We are a small, but strong and intelligent group of girls. We live in Monterrey, Mexico and we attend the American School Foundation of Monterrey. "I have learned that I can be free in this group and be myself!" "I learned that you can have your own point of view and you can share it because the other girls in the group will respect it." 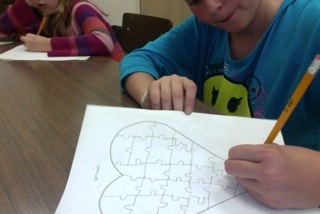 We loved creating our perfect world and designing our heart maps.